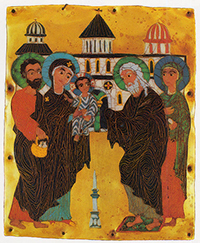 Today, both the Eastern and Western churches observe the Feast of the Purification of Mary (known as "Candlemas" in the West), exactly forty days after Christmas. In the Catholic tradition, the Christmas Cycle officially ends with this day, and preparation for Lent can begin, which includes the "Carnival" season in much of South America. But today, and throughout the world, the faithful will process in and around their churches bearing lighted candles, which are blessed for the coming year. The origin of this feast is described in detail, in this excerpt from the classic work of Dom Prosper Guéranger, OSB, entitled The Liturgical Year. This year's announcement is here, provided by CBS News. This is the short version. The entire thirty-minute pre-recorded livestream (and if you are ready for a less conventional approach, at least in part), is to be found here. In Catholic Europe, they say that if Candlemas is clear and bright, there will be six more weeks of winter. In Germany, this idea became, "If the bear comes out and sees his shadow, he will grumpily go back into his cave, and winter will last another six weeks." Then this feat of prediction was ascribed to German badgers. And since badgers are not found in the eastern U.S., German immigrants to this country were obliged to depend for meteorological guidance on a species of marmot called by the Indians 'weejak' or woodchuck, also called ... the groundhog. Today, if Punxatawney Phil sticks his nose out, you tell me if he isn't carrying a candle-holder. He's Catholic, you know. You just can't argue with reasoning like that, don't you think?